So unfortunately, Project Wonderful, the realtively unobtrusive banner ad service that me and quite a few comics use, announced yesterday that they're shutting their doors. If you're able and feel like chipping in a little, I have a Ko-Fi for one-time donations and a Patreon, where I show off art and sneak peeks of upcoming things like bonus Q&A comics and my SpiderForest anthology story! 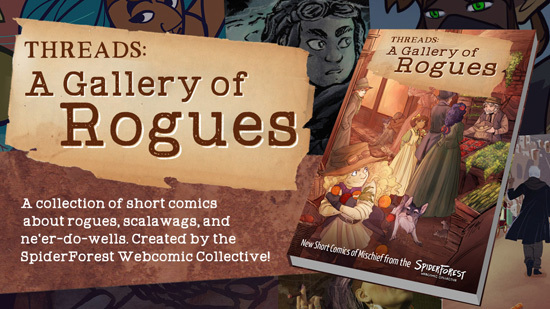 Speaking of which, the SpiderForest Rogue Anthology crossed over to 40% funded yesterday! Whoo! We've got two weeks left, so back it soon!